This is one of those situations where one cannot use the common name for the species. 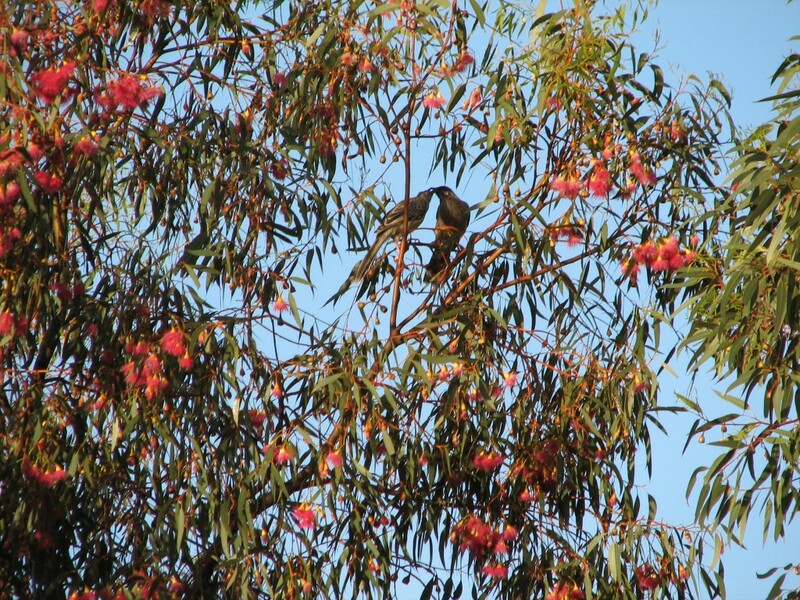 Blue gum is the common name given to a few Eucalypts. The Tasmanian Blue Gum is Eucalyptus globulus. The Victorian Blue Gum is Eucalyptus globulus subspecies bicostata. The Sydney Blue Gum is Eucalyptus saligna. 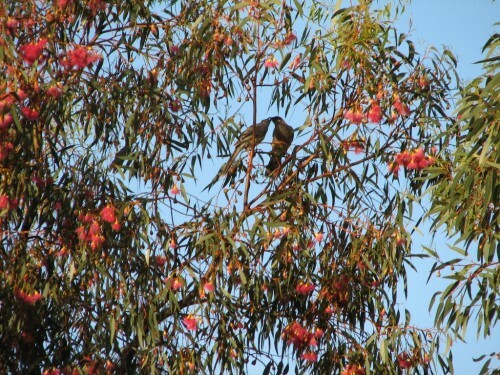 This photo has Little Wattle Birds in the canopy of the tree. We were visiting a garden and sitting outside having a cuppa watching all this bird activity. You seem to know a lot about eucalyptus gum trees. I got a potted tree about ten years ago. I just love it. Every year it gets smaller and smaller with fiewer and fiewer leaves. This year when we moved it caused great stress to my tree. Im scared it may not make it. By looking at photos i believe it is a Leucoxylon although I have never had flowers. Is there anything that I can do or add to the soil that will help it regain its health? Eucalypts have large root systems. If your plant has been in a pot for 10 years, and is losing leaves, you need to do a few things. First, make sure the potting mix is actually getting wet. Dunk the pot in a bucket/tub of water to which you have added soil wetter. Let it soak for a few minutes until bubbles stop rising. Then let the pot drain well. Pot the plant into a bigger pot. Water it well with sea weed solution. Put it in a warm place where it gets morning sun and good light. Hopefully some or all of these things will save the plant. Stumbled across your site whilst researching eucalypts for my garden. I hope to contain 3 x eucalypts in a planter box measuring approx. 4.5m x 1.5m (depth 1m). Would you suggest this is sufficient space? I am hoping to dwarf or ‘bonsai’ the tree’s to a max. height of around 5-7m. Do you have any suggestions regarding the eucalypt most suitable/tolerant to my intent, here in the cooler Tasmanian climate. I would like to see some red or white flowers and remain true to my Tasmanian native garden. Hi I have a Blue Gum with leaf gall. We’ve been told it is due to the excessively wet winter in SA last year (2016) and that it should rectify itself in 2-3 years. Do you know if this is a common issue for this tree? We have just moved in and are concerned more wet winters will continue to exacerbate the problem.